**NOW AVAILABLE IN FLAC FORMAT** Now we always suspected that Kode 9's influence went beyond the confines of the insular dubstep scene, but few could have expected this latest release from his influential Hyperdub imprint. Quarta 330 is a Japanese producer, so not from your usual South London dubstep posse but more than that, he produces using sounds better suited to the 8-bit chip on a Nintendo Gameboy (pre-DS, you know, the little grey ones. come on!). Now the chiptune genre has been around for ages, but rarely has it collided with the bass weight you'd expect from dubstep. Quarta 330 isn't the first artist we've seen do this lately, the astute among you will no doubt have Disrupt's killer 'Foundation Bit' still firmly in mind, and that's a good starting point for thinking about Quarta 330. I say starting point because where Disrupt uses the chip sounds as just an element in his productions, Quarta 330 employs them singularly, which makes his re-hash of Kode9's seminal '9 Samurai' quite immensely good - and an utterly indispensable tool to boot. Interestingly Kode 9 originally used samples from a Japanese film while producing the track, so in many ways it has come full circle and this fresh 8-bit version is so impeccably charming and funny you can imagine it devastating pretty much any floor. 'Sunset Dub' is killer too, with more bass than has ever been squeezed out of the humble 8-bit chip and the kind of melodies that would have Mario chucking out fireballs in a frenzy. 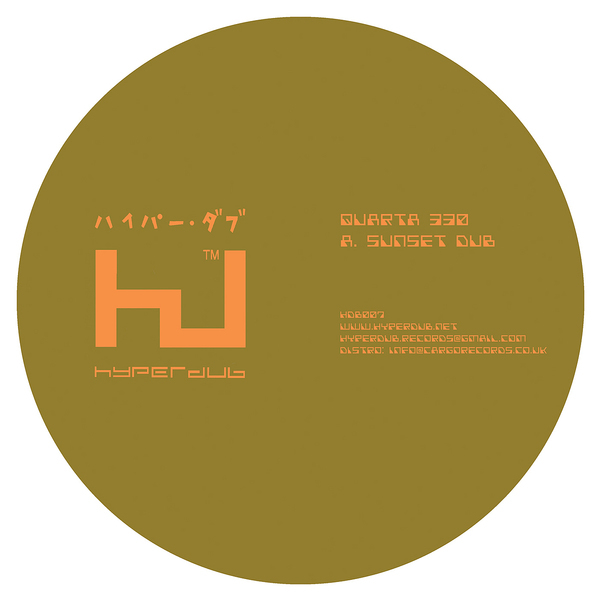 A stunning and surprisingly original 12" - Hyperdub do it again.